To use an oft spun phrase, “life is full of surprises” and our children provided us with two big ones on Saturday night. The first was a dinner to mark our 30th wedding anniversary, which Jeff and I were informed would be dinner in town with extended family, but that actually turned out to be a very well-planned and executed surprise party. Most of our original wedding party were there as well as many of the original guests plus some new friends we have made on our journey together, including my niece who was but a twinkle in her mother’s eye at the original event. The wonderful Cindy, cake decorator extraordinaire, produced a perfect replica of our wedding cake from a photo “secretly squirrelled” to her. Our wedding albums were on display to provide entertainment via 1980s fashions and hairstyles as well as brainteasers trying to remember who was who. 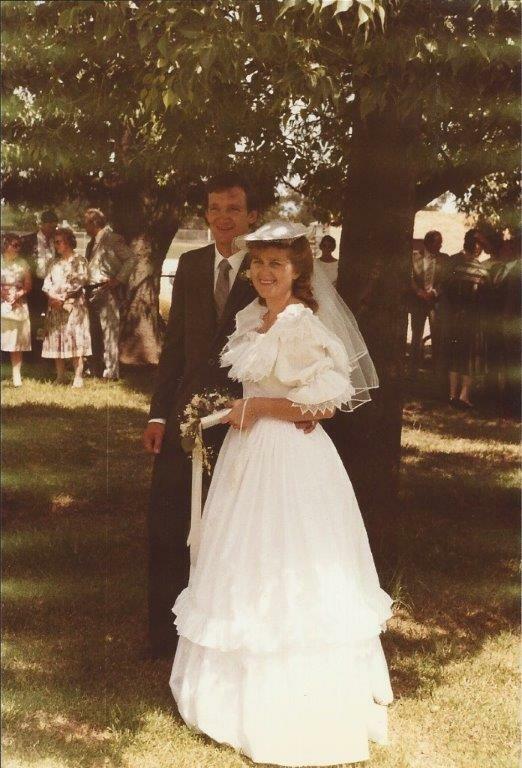 Tables were laid with pink cutlery to replicate the bridesmaids’ dresses, one of which Mum produced and Emma duly modelled – after 30 years though it looked more like a sad shiny shower curtain than the starched taffeta I remembered! The second surprise that eventually surfaced was the level of skulduggery that had gone on to maintain the ruse! Any parent worth their salt and living in the real world knows that they will never attain full disclosure from their children so I’m not surprised that they can tell a few white lies, but it’s the apparent ease with which they delivered one after the other, that I find a little unnerving!! Especially the imaginative excuses the boys came up with to circumvent Jeff’s curiosity and escape off farm to complete various tasks. All of these little deceptions added to the evening’s entertainment and increased our appreciation for the effort they had put in to ensure a wonderful evening to mark this milestone in our lives. When it came time to make a speech or two Jeff insisted I hold his hand, as he had done 30 years ago, but thanking Emma, Marc, Josh and Roz proved much harder than our first attempts at public speaking. Both of us were unable to adequately articulate all our thoughts at the time; we had some weird affliction that constricted our throats. Aforementioned salty parents will know what I mean. I’ll admit to being guilty of committing a few sins in my life and if pride in my children sends me to purgatory, I’ll go willingly. It was so nice to spend Saturday at the rugby watching the Narrabri Blue Boars and Inverell battle it out on the Boars home ground at Dangar Park. 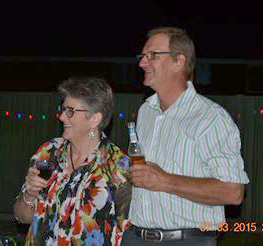 Our eldest son, Josh, plays for Narrabri and rugby has been a passion since we traipsed all over the North West, in his primary school years, for junior rugby carnivals. Jeff played for Narrabri in his younger days and so we often share the sideline with his (old) team mates, there to watch their own offspring compete alongside Josh. It’s quite comfortable and familiar turf, you might say. 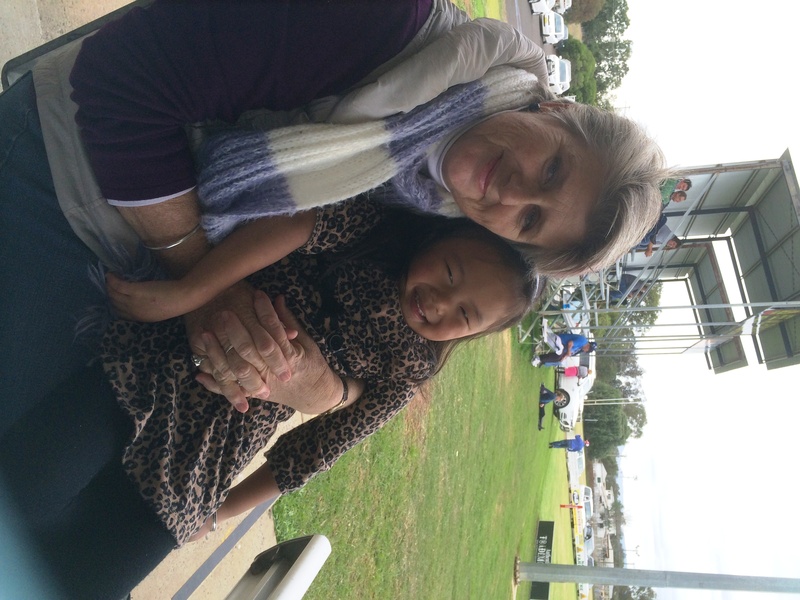 The day also afforded me the opportunity to spend some time with my beautiful niece, Jiaying or Missy Moo, to me. Jiaying is the adopted daughter of Jeff’s sister Gail and husband Michael and she will celebrate her 5th birthday in October. Having witnessed the frustratingly slow, seven year adoption process first hand, I have followed Debra-Lee Furness’s campaign to have Australian adoption laws overhauled with interest and I was pleased to see an interview with her recently that heralded some changes. The adoption process (in some cases) can only commence once other avenues have been exhausted and so it can often result in the (unintentional) consequence of ‘older parents’. 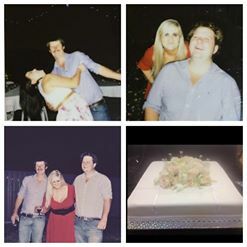 In Gail and Michael’s case, for various reasons, they became parents almost 20 years after they had hoped. Their lives are richer and their family complete, but what if they wanted a sibling for Jiaying? And let’s not raise the subject of financial as well as emotional cost. Gail and Michael almost “threw in the towel”, but luckily for all of us, they persisted and now my Missy Moo not only has a mummy and daddy, but grandparents, aunts, uncles, cousins, pets and a brighter future than the Chinese orphanage, on whose steps she was left, would have been able to provide. Time to reign in the rant and go back to my enjoyable day out with family, friends and neighbours, watching several games of club rugby followed by a few drinks in the club house chatting and reminiscing, whilst watching the obligatory and time honoured “boat races”, also won by Narrabri! Unfortunately Inverell went home empty handed on all fronts. Jeff and I made our exit, along with most (but not all) of our peers at this point and left the next generation to the usual weekend “rituals and rites of passage”, hoping that tucked somewhere in our children’s’ sub-conscience were all the words of wisdom we’d tried to instil in them before they reached puberty and then knew it all. Enter reality and breakfast on mother’s day was spent listening to the antics, gossip and dramas of the post rugby party the night before and suffice it to say that some things never change! This included Jeff and I having to resume chauffeuring duties for the trip home whilst the social butterflies caught up on their sleep, nursed sore heads and avoided breathalyser units. But the fact that they are comfortable sharing most (I’m not that naïve!) of those experiences with us, is something to be treasured. Maybe we did a good job after all. Hope your Mother’s Day was as enjoyable as mine. Rowena Branch Members of CWA have, for many, many years, hosted the annual Christmas party for children who attend the local school, pre-school or who live on the mail run. I’m not exactly sure how long the tradition has been running but Jeff says Santa was making the Rowena Run when he was at school….and that’s a loooong time ago! Our children (who must have been good at some stage) participated in this long running activity and still enjoy catching up with Santa and reminiscing about their experiences; I overheard Josh comment that he didn’t recall receiving any gifts as good as some he noticed this year!! Over those countless years Santa has arrived via many modes of transport with possibly the most exciting being a helicopter! Parts of the district had, unlike this year, received huge amounts of rain and an impassable creek dictated the trip from Santa’s Australian home should include a boat, bike, plane and finally the helicopter, which landed on the school oval, with the reverse required for the return journey. 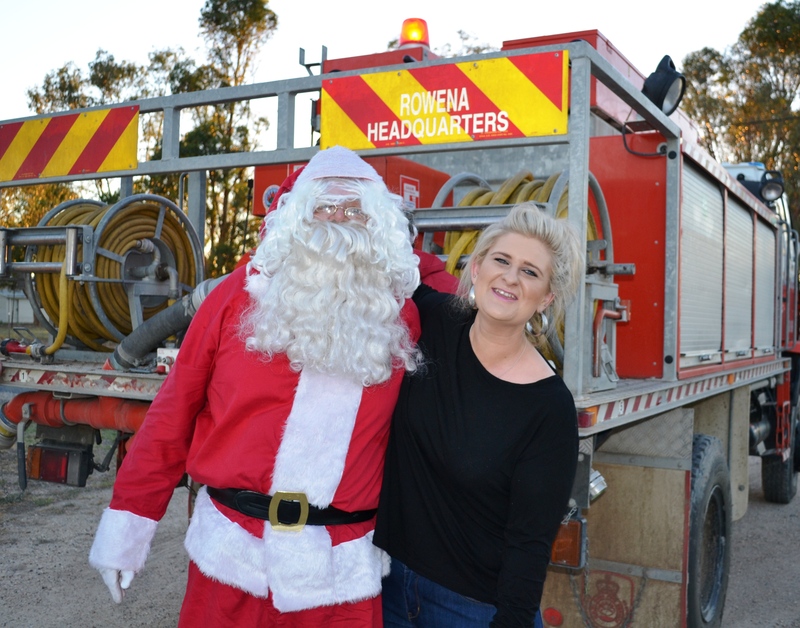 A huge team effort by some very generous locals, including Santa! 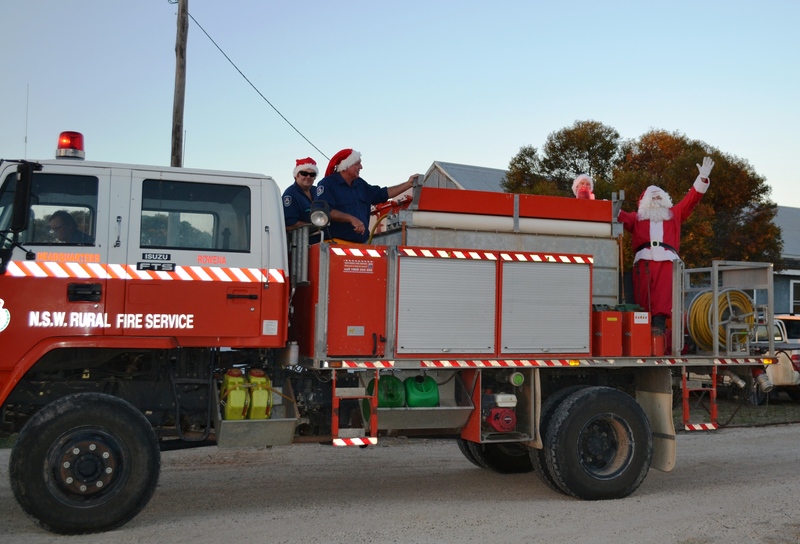 This year Saint Nick was again transported by the local Rural Fire Service (aka Santa’s elves) in the red ‘bush sleigh’ complete with siren and flashing lights; swapping Reindeer power for horsepower because the Reindeer get overheated once the thermometer passes 30°C. 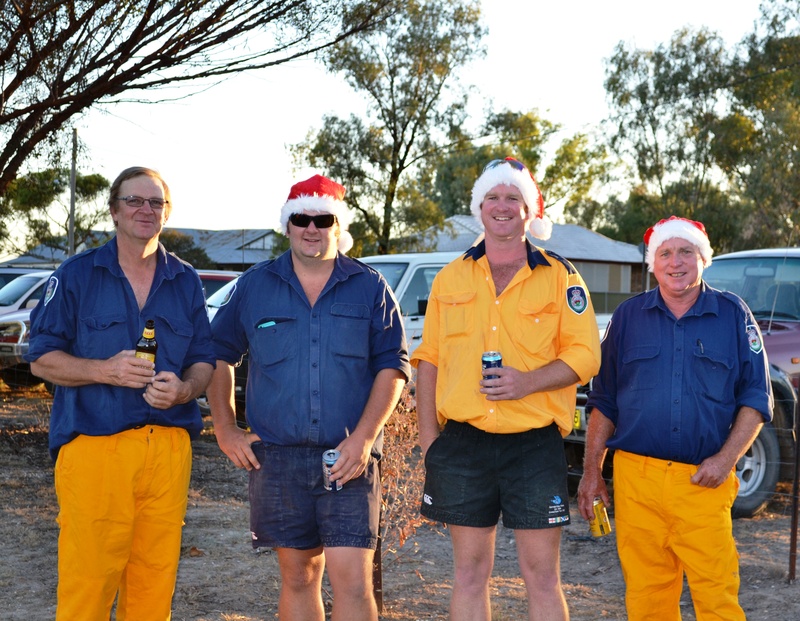 The photo shows this year’s Elf Crew of Jeff and our youngest son Marc with Tim and David Cameron (State Secretary, Jocelyn’s, son and husband), a family affair with Jeff and David being cousins. There are other volunteers in Rowena, but they were digitally recording alleged evidence of good behaviour by their children/grandchildren, which could later be used against them. Gifts for each age and gender, specially selected by The Chief Elf Organiser (CEO), were merrily distributed by Santa to those on the good list which, miraculously, included all the Rowena children! The P & C then provided a sausage sizzle that, along with other delicious contributions, fuelled energy levels for the disco that followed, where the Macarena and mirror ball proved almost as popular as Santa and the presents! On a different note, I plan to give you a couple of weeks break from my ramblings, but would like to take this opportunity to thank you for following my new ‘journey’ and to wish you a Christmas filled with laughter and good company and may the New Year bring whatever you need most.